We present a case of a limb-threatening thromboembolism in a small neonate with hypoplastic left heart syndrome that was successfully treated via transcatheter thrombectomy during ECMO support. A 2.5-kg term newborn female was born with hypoplastic left heart, critical aortic stenosis, and an intact atrial septum. She underwent emergent balloon aortic valvuloplasty and atrial septal perforation and balloon septostomy on day of life (DOL) 1. After valvuloplasty, her left ventricle (LV) appeared smaller, but the left atrium (LA) was not decompressed and transseptal puncture was performed demonstrating LA hypertension. Septostomy was performed over atrial stent to continue to promote LV filling. Nonetheless, the LV appeared more hypoplastic. She remained critically ill and was not able to wean from prostaglandins (PGE) because of left heart hypoplasia. On DOL 5, she suffered cardiac arrest before a planned Damus–Kaye–Stansel (DKS) operation, and venoarterial ECMO (Stöckert Centrifugal Pump Console (SCPC) console [Sorin LivaNova, London, UK] and polymethylpentene oxygenator [Maquet QUADROX, Rastatt, Germany]) cannulation of the right carotid, and internal jugular vein was performed emergently in the Cardiac Intensive Care Unit (CVICU). She underwent DKS surgical palliation on ECMO day 2 and returned to the CVICU with an open chest and continued ECMO support without variation on her cannulation sites. She was re-explored for bleeding and heparin was discontinued for 8 hours. She received multiple blood product transfusions including platelets, fresh frozen plasma, cryoprecipitate and packed red blood cells. She experienced close to 37 cc/kg of blood loss. Despite good cardiac function on echocardiogram, she was unable to wean from ECMO support, and during this time, thrombus formation was noted on the oxygenator. On ECMO day 5, she had a sudden, transient decrease in ECMO flow secondary to hypovolemia-related ECMO pump deceleration. After urgent volume administration, ECMO flow was restored, but loss of lower extremity pulse oximetry and arterial line tracing were noted. Examination revealed cold, pulseless, pale legs and feet. 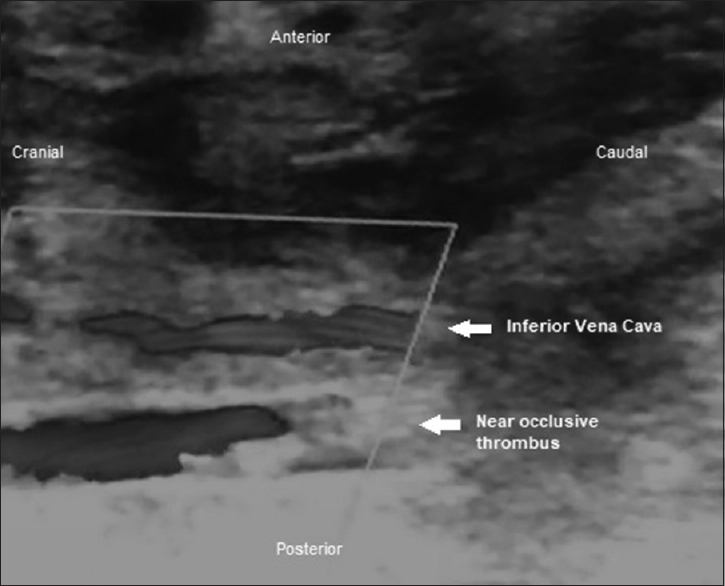 Emergent point-of-care bedside ultrasound revealed a large, near-occlusive thrombus in the distal aorta just proximal to the iliac bifurcation with dampened color Doppler flow noted distal to the thrombus [Figure 1]. She was emergently taken for Angiojet ® (Boston Scientific, Boston, MA) transcatheter thrombectomy. 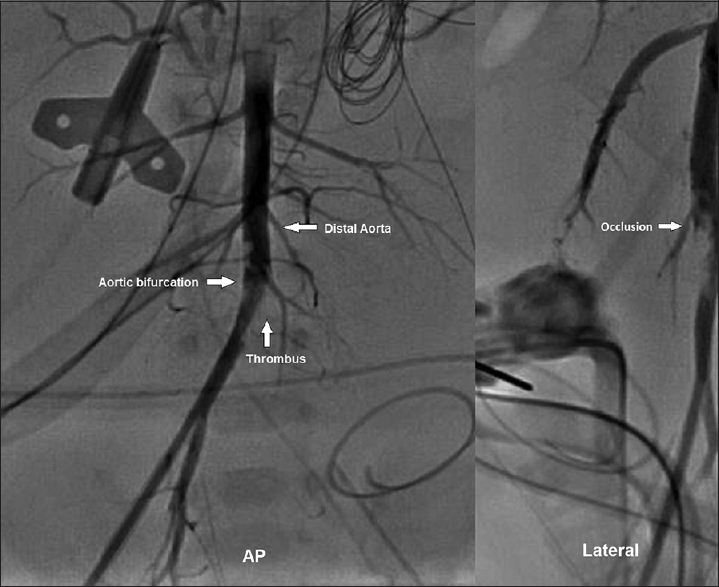 Through a 4F right femoral arterial sheath, angiography demonstrated a near-occlusive thrombus in the distal aorta [Figure 2]. A 0.014 Roadrunner ® (Cook Medical, Bloomington, IN) wire was positioned in the aorta. Four passes with a 4F Solent™ Dista (Boston Scientific, Boston, MA) catheter over the wire were performed (each pass for approximately 10 s). There was no associated bradycardia during the thrombectomy, and no change occurred in ECMO flows. Pulsatile pressure returned to femoral arteries and perfusion was restored to her lower extremities. There was an associated improvement in angiographic distal abdominal and iliac artery flow [Figure 3]. Clinically, the legs transitioned from cold and pale-white to pink and warm with brisk capillary refill. Over the next 8 days, she remained on ECMO with an open chest. She remained well perfused in both lower extremities without clinical concern for a new thrombus. Unfortunately, head ultrasounds ultimately demonstrated significant intracranial hemorrhage, possibly a hemorrhagic conversion of embolic stroke. Therefore, she was decannulated on ECMO day 13, but was unable to maintain adequate blood pressure and cardiac output, and she died despite aggressive resuscitation measures. Thrombosis is a frequent complication of pediatric ECMO and is associated with organ infarction and increased risk of mortality. Longer ECMO duration increases the risk for thrombus formation. Transfusion of multiple coagulation factors and platelets and reduction of heparin likely contributed to ECMO circuit thrombus formation in our patient. The patient then presumably had embolization of the thrombus upon sudden deceleration/acceleration of ECMO flow and occluded her distal abdominal aorta leading to profound leg ischemia. In our experience, thrombus management in pediatric patients in the ICU varies depending on the symptoms. If the patient is asymptomatic with a line-associated thrombus, they would usually receive 6 weeks of enoxaparin. If there are symptoms, management options include recanalization of a line, balloon venoplasty, thrombolysis, thrombectomy, and aggressive heparin treatment., Management with tPA thrombolysis and surgery were contraindicated in this critically ill patient, given the significant risk for life-threatening bleeding after her recent cardiac surgery and open sternum. Therefore, the safest and least invasive treatment option to save her legs was deemed to be emergent catheter thrombectomy, in this case using AngioJet ®. This device has a coronary artery, venous, and peripheral arterial indication. Given the lack of testing in the neonate, this is an off-label use of the device. Despite this critically ill child's very small size and multiple comorbidities, this procedure was well tolerated and successful without noticeable complications. Clinically, perfusion was immediately restored to her lower extremities with angiography confirming good flow in the distal abdominal aorta through the iliac bifurcation. The risks of bleeding and thrombus formation during ECMO support are well described in the pediatric population. Despite multiple studies and alternative approaches to anticoagulation therapies, the incidence of ECMO-associated thrombosis remains high. Therefore, clinicians managing ECMO must be aware of treatment options for acute thrombosis, given the time-sensitive nature of ischemia and tissue death. Treatment must be individualized for each patient's clinical condition and comorbidities, with consideration for unique side effects and possible complications. The case we present is an example of successful use of Angiojet ® rheolytic thrombectomy for treatment of an acute arterial thrombus associated with ECMO support in very critically ill neonate. A case review by Qureshi et al. discussed 21 patients who underwent thrombectomy by rheolytic or aspiration systems, none of which were related to ECMO support or as small as our patient. We believe this case to be the first report detailing thrombectomy by catheterization in a patient supported by ECMO after cardiac surgery. Successful thrombectomy despite the small size (2.5 kg) and very high severity of illness and comorbidities was also unique aspect of this case. Angiojet ® thrombectomy is a novel treatment option that should be considered for acute thrombus, with tissue ischemia in small children supported on ECMO or other clinical situations in which there is a contraindication for systemic thrombolytic therapy or surgical intervention. Werho DK, Pasquali SK, Yu S, Donohue J, Annich GM, Thiagarajan RR, et al. Hemorrhagic complications in pediatric cardiac patients on extracorporeal membrane oxygenation: An analysis of the Extracorporeal Life Support Organization Registry. Pediatr Crit Care Med 2015;16:276-88. Dalton HJ, Reeder R, Garcia-Filion P, Holubkov R, Berg RA, Zuppa A, et al. Factors associated with bleeding and thrombosis in children receiving extracorporeal membrane oxygenation. Am J Respir Crit Care Med 2017;196:762-71. Cho HJ, Kim DW, Kim GS, Jeong IS. Anticoagulation therapy during extracorporeal membrane oxygenator support in pediatric patients. Chonnam Med J 2017;53:110-7. Reed RC, Rutledge JC. Laboratory and clinical predictors of thrombosis and hemorrhage in 29 pediatric extracorporeal membrane oxygenation nonsurvivors. Pediatr Dev Pathol 2010;13:385-92. Garcia A, Gander JW, Gross ER, Reichstein A, Sheth SS, Stolar CJ, et al. The use of recombinant tissue-type plasminogen activator in a newborn with an intracardiac thrombus developed during extracorporeal membrane oxygenation. J Pediatr Surg 2011;46:2021-4. Gerardin JF, Anderson CS, Armstrong AK, Grifka RG. Descending aorta thrombus in a neonate mimicking coarctation of the aorta: Mechanical thrombectomy using the Angiojet(®) catheter. Catheter Cardiovasc Interv 2013;81:E134-8. Fleming GA, Khan M, Janssen D, Doyle T. Angiojet rheolytic thrombectomy in infants following cardiac surgery. Catheter Cardiovasc Interv 2010;76:233-40. Law MA, McMahon WS, Hock KM, Zaccagni HJ, Borasino S, Alten JA, et al. Balloon angioplasty for the treatment of left innominate vein obstruction related chylothorax after congenital heart surgery. Congenit Heart Dis 2015;10:E155-63. Diaz F, Sasser WC, Law MA, Alten JA. 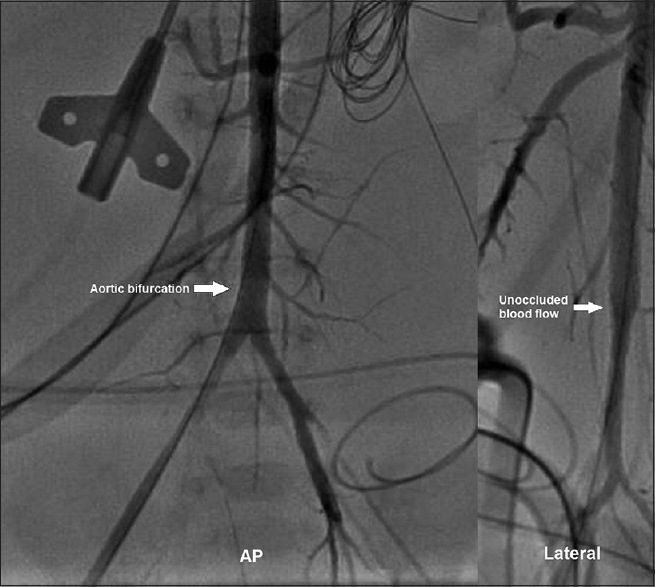 Systemic thrombolysis with recombinant tissue plasminogen activator for acute life-threatening Blalock-Taussig shunt obstruction. Indian J Crit Care Med 2016;20:425-7. Qureshi AM, Petit CJ, Crystal MA, Liou A, Khan A, Justino H, et al. Efficacy and safety of catheter-based rheolytic and aspiration thrombectomy in children. Catheter Cardiovasc Interv 2016;87:1273-80.